Winter Sowing is the process of planting hardy and half-hardy seeds in clear or transluscent containers (milk cartons, 2 liter soda bottles, juice containers.) 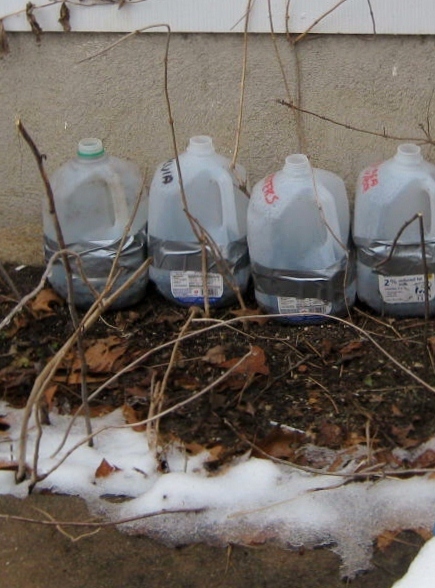 The containers are then sealed with duct tape and placed outdoors in the winter weather. This method of sowing seeds has been attributed to Trudi Davidoff. The above photograph is a record of my first attempts at this process. Over the next week or two I hope to Winter Sow more of my perennial seeds, and later in the season some of my vegetables, annuals and herbs. A good source of information and discussion about Winter Sowing can be found on the Gardenweb Winter Sowing Forum. I’ll update my success with this method as the season progresses.